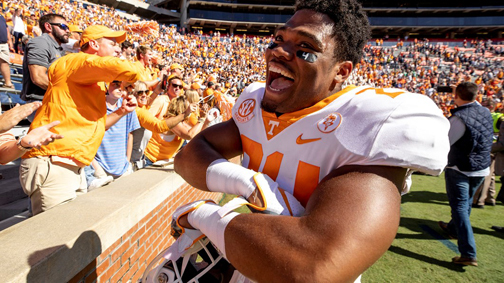 Defensive back Todd Kelly Jr. celebrates the Vols’ biggest win of the year at Auburn. The redshirt senior has just three games remaining, four if UT becomes bowl eligible. Todd Kelly Jr. could have just moved on from the University of Tennessee instead of returning for a fifth year. He was rehabbing from an injury, the Vols were in rebuilding mode under a new coaching staff and he had his degree. But football is all Kelly’s ever known, and playing for Tennessee is all he’s ever wanted to do. With only three regular-season games remaining, Kelly is savoring his final few moments in a UT uniform. Although it’s not been the ending Kelly envisioned, the redshirt senior safety is grateful just to be back on the field. Kelly sat out nearly all of last season with a knee injury and was granted a medical hardship waiver to come back this season. Going from walking on crutches for several weeks to making tackles on the field has provided Kelly with a renewed appreciation. He saw his first action of the season on special teams against Georgia on Sept. 29, and earned his first start in the secondary two weeks ago against South Carolina. In last week’s victory against Charlotte, Kelly made a season-high seven tackles. He’s hoping to contribute even more when Tennessee (4-5, 1-4 SEC) hosts No. 12 Kentucky (7-2, 5-2) on Saturday at Neyland Stadium. During his long recovery, Kelly was involved in an off-the-field incident that was surprising for an athlete with such good standing in the community and in the classroom. Kelly fell from a 30-foot wall after an alcohol-driven altercation with his girlfriend last January, police reports show. No legal ramifications resulted. Kelly makes regular visits to local schools to mentor children and has been the first to volunteer with nonprofits. As a junior at UT, Kelly changed his jersey number from No. 6 to No. 24 to honor Zaevion Dobson, the Fulton High football player who was tragically killed while shielding friends from gunfire. 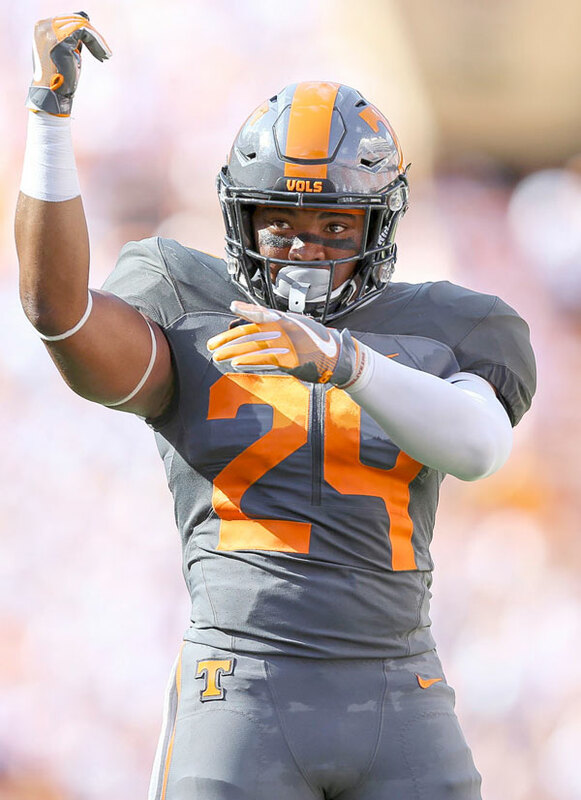 Defensive back Todd Kelly Jr., a second-generation Vol, suffered a serious knee injury last year that could have allowed him to make a graceful exit. Kelly, the 2013 Gatorade State Player of the Year for Tennessee, followed in his father’s footsteps by attending UT. Todd Kelly Sr. was a star for the Vols in the early 90s. He was drafted in the first round by the San Francisco 49ers and spent four seasons in the NFL. But Kelly Sr. often told his son “the NFL stands for ‘Not for Long,’” and he needed to value the relationships he was building while securing a strong academic backup plan. Kelly had surgery on his knee during his freshman year of high school, but it never bothered him again until his junior year at UT. UT head coach Jeremy Pruitt has lauded Kelly’s attitude throughout his road back to full health. After Kelly’s debut against Georgia on special teams, Pruitt recalled the small setbacks Kelly incurred in the previous few months. Rather than being a deterrent for returning, the coaching change was a major factor in Kelly’s decision to play another year at UT. Kelly remained a leader for the Vols even when he wasn’t playing. He tried to help the younger players in the secondary, including freshman cornerbacks Bryce Thompson and Alontae Taylor. Kelly let them know what it means to play at UT and taught them about the history and tradition of the program. His biggest piece of advice, however, had nothing to do with football. After all the years he grew up dreaming about playing for UT, Kelly admits it almost feels “surreal” that it’s coming to an end. As a child, he used to sit in Section YY at Neyland Stadium and watch the Vols run through the T. He only has two more opportunities to do that now as a player.